Live video is beyond doubt the new cool kid on the social media block. You can go live on pretty much all of the major platforms. Facebook, being one of them, continues to spice it up with new features, like split screen, allowing you to invite your friends or even random people to join your live cast. Most social media platforms offer live video posting, Snapchat being the most obvious, with over 10 billion snapped videos per day. Instagram lets you take live video, and you can even make video ads, but you pay IG for that, instead of the other way around. Twitter is entering the video world with a strong start, rolling out a video editor and changing Periscope to Twitter Live. Facebook, the hot spot for live video today, reports that live videos on the platform are watched three times longer than any other video, even those that were recorded on Facebook live. That’s all cool and exciting, but can you actually get your business to profit from live video? Yes, you can! This blog post will tell you about multiple ways to do just that. Not a lot of freelance SMMs and small businesses have gotten into live video yet. So if you do it now, there is quite a competitive advantage for you! Yes, there’s no content creation template for a live video. It’s just you in front of your smartphone or webcam. And, you can’t exactly schedule it in your social media management software. But it opens up a whole new field of opportunities for social media marketers, that, at this point, isn’t oversaturated. 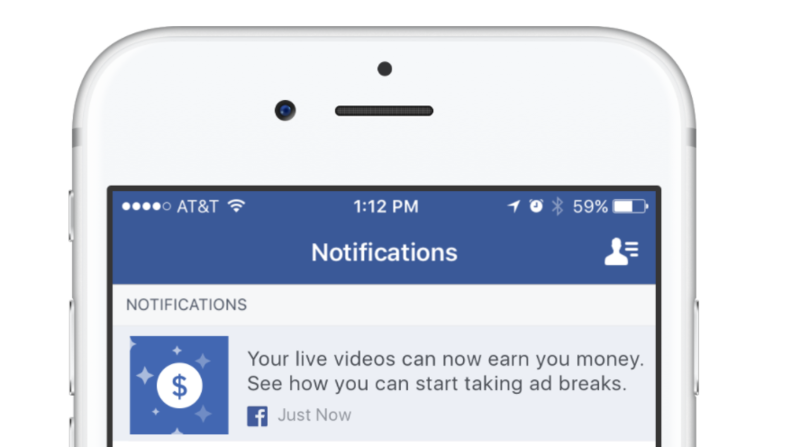 Let’s start with how to “get paid” by Facebook for your live videos. Is It Possible To Get Paid? We all know people on YouTube and many other social platforms have been able to get paid and even make a living because of their traffic and ratings. Just ask Jenna Marbles. However, the idea of broadcasting yourself live is relatively new on social media platforms. Facebook, who rolled out Facebook Live in August of 2015, is now making it possible for some pages to monetize their live videos. Remember, this is by far not the only type of ROI you can get out of it, but you some users can get paid by Facebook. So what’s the catch? How Do I Make Money On Facebook Live? Once you’re signed up for Ad Breaks, Facebook’s rules about the process of getting paid are pretty simple. Eligible participants in the ad program need 2000 or more followers on their account. The Ad Breaks option is available and it helps you get paid for your online live broadcast content. Less than 2000 followers will not let you enable the Ad Breaks feature. That’s not a deal-breaker, because there are plenty of benefits to posting live videos, and we’ll discuss that in a moment. For ad breaks to work, you need to have at least 300 people watching you live. To explain the process further, the ad break works when you broadcast yourself for 4 minutes at least, once that is done, an ad break, which is an advertisement, of 15 seconds, will appear. Once that is done, the ad break will occur after every 5 minutes once the first ad break has aired. It is pretty much like broadcasting a television show and making money from the commercials. The advertisements are there for the sole purpose of generating revenue; the platform supports your content transmission and also earns from whatever you put on, and you get paid. 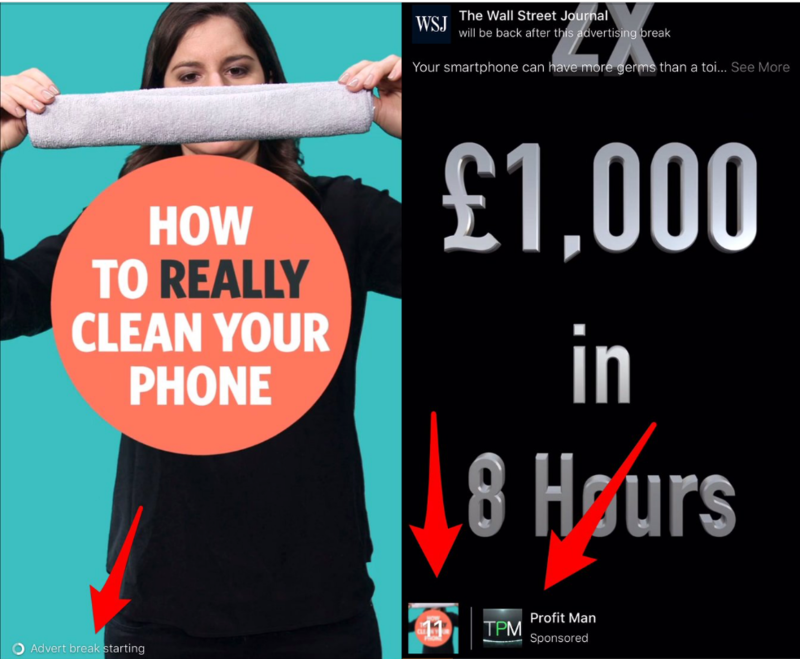 These are the 2 examples of what FB ad breaks look like, via Matt Navarra. Just so you know, YouTube requires you to have 10,000 subscribers to be eligible for streaming live videos in order to turn a profit (but otherwise anyone can go live on YT). How Is The Money Shared and Received Via Facebook Ad Breaks? The preferred payment method is via PayPal. Facebook and YouTube share 55% of what the live stream has generated, based on the Ad Break revenue. As far as receiving the payments, you need to have PayPal or a supported online bank account to receive money. But there are minimums and requirements you have to keep in mind for Paid Ads. Facebook, for example, requires you to have received $100 to be able to get the money. You will get paid every month if your earnings are $100 or more. However, income from Paid Ads is an instant-gratification means of realizing money from your live videos. Let’s look at the long-term benefits of live videos and why you should do them, regardless of the amount of followers you have. What Should Social Media Marketers Know About Live Videos? When you’re thinking about live videos, you need to think about where they fit in your overall social media posting schedule. Content marketing best practices say that you need to create value, whether you’re a freelancer providing social media services for small business or an agency trying to move the needle with your social media calendar. Keep in mind that you don’t have to be part of Ad Share to see a return on investment with your live videos. Your live videos can provide value that will convert – by leading users to landing pages, encouraging them to make purchases and more. Content creation for social media is an art, and you can get artful with your live videos. Let’s take a look at the types of live videos that can result in payment down the road. Call it your quick and dirty social media marketing guide 2017 for live video. One of the most valuable things you can give your fans and followers is information. Not information about your products or services (though you’ll do that too, and we’ll talk about that in a minute), but information about your brand, your business and industry. One great example is the top Facebook expert Mari Smith. She creates awesome videos that get super reach and are very much enjoyed by her audience. You can also use https://belive.tv/ for additional features that Facebook might be lacking at the moment. Think about when you get to see behind the scenes footage of how your favorite show or movie was made. Isn’t it exciting? To make your business more relatable, think about giving them a peek behind the scenes. Your customers love your product or service, so they would also love to see how it’s all done. For people who are marketing a company or a retail store, give a look around the office. Or, if you’re a freelancer helping a small business or brand with social media marketing services, you can go in person or write a script for them to use when they do their live video. Giving users a look inside an operation makes them feel closer to it. Amazon has this corporate philosophy called “Customer Obsession.” The best social media marketers approach their customers the same way, and what better way to provide excellent customer service than to answer a bunch of frequently asked questions live? You’re likely to get a lot of viewers if you do your pre-marketing correctly, and if you can, answer the questions that come in during your live video. People love to learn things for free. Just like instructional videos on YouTube (think makeup tutorials) are so hot, that trend has extended to Facebook Live. Make sure you’re giving information your users want, and interact with your viewers as you’re presenting. Of course, you’ll want to do live videos to promote your business as well. You can do it in a way that isn’t an infomercial or boring old sales pitch. There are tons of live video content creation examples out there of folks who are doing it right, but let’s give you an overview of what we’re thinking about. What better way to get someone to want to buy a new product or service than to show it to them? Buying decisions are generally made in the moment, and the closer a customer can get to the thing you want them to buy, the better. So, short of someone coming into a brick and mortar store and picking a thing up, live videos are a great way to explain the value of a product (or service – don’t underestimate the power of a walk through!) to entice people to buy it. You can offer a free gift for one lucky recipient, or a free product or trial for someone who views the live video. Just make sure you’re following the content marketing guide Facebook sets forth in terms of promotions for your state. Don’t break any rules! Having a sale? Tell your social audience about it! Promote it by letting people know what time the sale is going on, and then showcase the sale products during your live video. Offer good prices, but make sure you are clear about the terms of the offer. Even if you plan on live streaming an event itself, why not make a special announcement prior to the event to entice people to come to the event (live or online). Track how many people watch your video, and give them a link to sign up for the event that you can also track. See? There are plenty of ways to make videos that can turn into money! But this is just the beginning. What Is The Future of Live Videos? 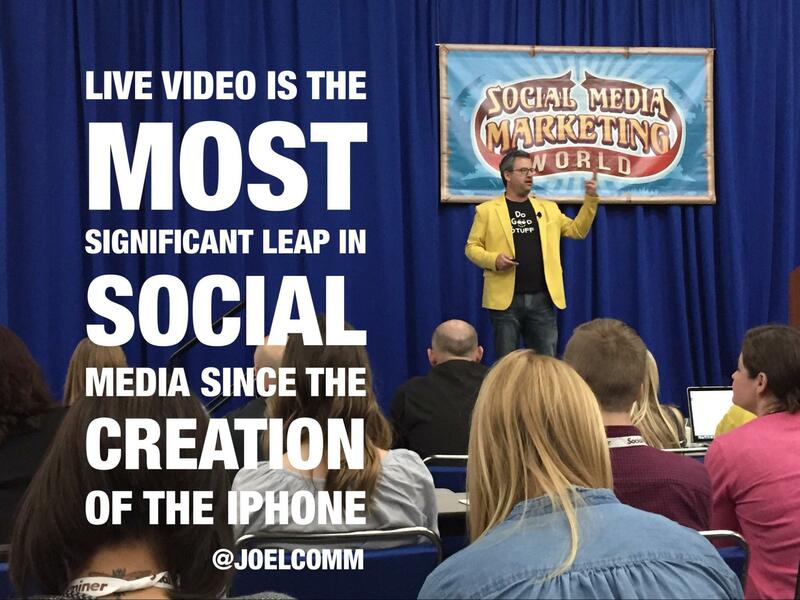 In his presentation at Social Media Marketing World 2017 Joel Comm said, “Live video is the most significant leap in social media since the creation of the iPhone”. And just like in the case of the iPhone, it’s obvious there’s much more to come in the live video space. According to Joel, we will definitely be seeing more complete studio tools to edit the videos, as well as more monetization options, and more devices to make it easier for us to be able to go live at any point while maintaining the best quality. When it comes to direct monetization, so far only Facebook and Youtube have joined the race, but it’s safe to say that other platforms will catch up soon enough. While all this sounds promising and very entertaining, it could take time to get the hang of it. You need to have engaging content that keeps the users interested. So keep that social media content generator going and don’t forget all the things you set up with social media marketing automation tools. While live videos cannot be automated, they are just one piece of a larger social media marketing puzzle. Along with knowing the right Facebook post size for 2017, understanding your target audience, and all the other bits of minutiae we all have to keep up with from day today, you have to figure out a way to work in live videos. You won’t be sorry.